The Meta Model : Beyond A Theory of Everything? A Data Trust-Sphere Analogous To A Life Biosphere : Or How Three Into One Will Go? The Fourth Order Effect : Or HOW the Next Big Wave of the Net Will Work Out & WHY? This profound insight into reality is so much more than a simple recognition of the tetrahedron as the most basic 3D space in the universe; it is so ubiquitous that you could liken it to the hydrogen of geometry. By simply adding time as a fourth dimension to allow for progression it gives us a basis for modeling and predicting how reality continues its fractal unfolding. As a glorious process it is both physical and metaphysical. The envolution or increase in functional complexity of the Net is a very visible process with much at stake. Not surprisingly many people are actively debating what will constitute the next big online revolution. How will the new contrast to pivoting on the existing, which is still inducing billions of dollars in speculation? Online derivatives will keep on emerging and seeking to differentiate in some way. Of course when this next paradigm does finally emerge everyone will be quick to say, “Of course it had to be so.” Which is so typical of our human nature to live life by furtively fumbling forward while we only dare to understand reality backwards with bold conviction. So how might we use a simple lens like the tetrahedron to provide us with the clarity to see the next paradigm shift of our current digital age? If you were to consider point A by itself as a single vertice or singularity then its most striking property would be one of freedom. It possesses the freedom to move out in any direction within 3D space. However, to use the vernacular it would be a ‘one trick pony’ with only the potentiality to emit or send. This correlates nicely with the nets first major paradigm; which was mail as your default post-box to the net. Now consider that we introduce point B. We now have two points with the same potentiality to emit, and we have also accumulated the vector between which allows for the potentiality to emit and to remit or to search, by finding and retrieving. This also correlates with the nets second major paradigm, which was the advent of search as the default portal to the net. 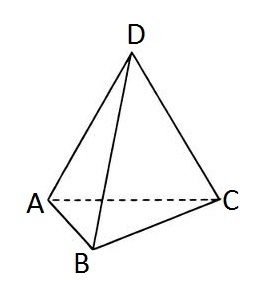 By adding point C we accumulate still further properties, giving us a 2D plane between it and points A & B. This allows for choice as well as an interior or gated community which all gives rise to the potentiality of a social network. This invariably leads us to correlate the third major paradigm of social as our default personality on the net. So where is this all heading, and how might it relate to the envolution of the Net? If we stop for a minute and consider once again the genius of Buckminster Fuller there are clues. It is not widely known that over and above Bucky’s own prodigious and original output he also had time to add a finishing touch to Plato’s own compelling triad. By adding self to the triad of beauty, symmetry and truth. Bucky turned the triad, which is flat, planar, and therefore non-existent in the 3D spatial universe into a tetrahedron. 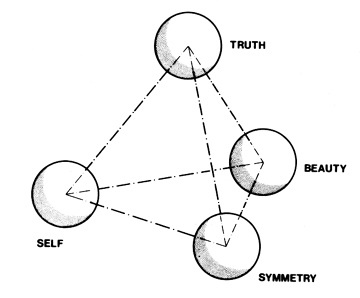 Adding self creates a tetrahedron, which in Bucky’s words is the, “unique symmetrical set of minimum interrelationships”. It is the primary system of intellect; self-witnessing the universe of beauty, symmetry and truth. It is the observer plus the observed. When we put all of this together; what you send from your post box, what you look at through your search portal and how you represent your social personality, all appears to converge at the core issue of self and identity. The self is really the sole owner of its own personal sovereignty, and yet it seems that this basic right is consistently violated by the default privacy settings and terms and conditions of the net. The accumulation of tetrahedral properties is stark and as an observer it seems that all points are directed toward a major movement to reclaim our core identity. Our desire to send, search and be social has unwittingly spread our digital exhaust such that the ramifications are only starting to emerge. Incorporating the fourth order effect by adding the fourth point at D simultaneously unites the other 3 privacy issues and will empower and liberate us as users and observers like never before. No longer shall we as individuals merely be the observed. Instead we shall have a 3D imperative to unite both the container and content aspects of our lives in our very own ‘sovereign data kingdom’, along with all of the core rights that personal sovereignty bestows. A = Send as our default post to the net. A+B = Search as our default portal to the net. A+B+C = Social as our default persona on the net . A+B+C+D = Sovereignty as our default privacy on the net. And so the macro envolution of the internet; the accumulation of functional complexity, as an entire system has so far taken on three generations which have largely determined the main centre of gravity for any given period of time. That is until the accumulated effect of each stage and its predecessors provides the new functionality required, …..and then a new paradigm is born. In order to consider the reasoning I have used here to arrive at the fourth new order let’s explore the nature of abductive reasoning. The tetrahedral lens I have used is based on ‘effect’ or pattern recognition and called abductive reasoning as opposed to the more oft understood base pair of inductive reasoning, which is ‘cause’ based and deductive reasoning which is ‘rule’ based. There is also a fourth type of reasoning, which is also often misunderstood, it is called conductive reasoning and is based on our ‘values’. It is this form of reasoning, so close to our hearts that yearns for personal sovereignty for ourselves, our children and their children to come. Inductive reasoning is when I look at the sky through a window and see storm clouds, because I have seen storm clouds cause rain before I decide to carry an umbrella by inducing or sensing the ‘cause’. Deductive reasoning is when I look at the measurements on my barometer and deduce or reason that the barometric pressure and level of humidity will mean rain, so I decide to carry an umbrella based on reasoning with a scientific ‘rule’. Abductive reasoning is when I know that cows have just laid down in the field and abduce or intuit that they have greater instincts than humans – as they still live out their lives in nature – and they would want dry bedding underneath them before the rains begin. So I carry an umbrella based on intuiting the superior instinct of cows and its non-apparent ‘effect’. Conductive reasoning is when I have no sensory data whatsoever but I conduce or understand that today I have a very important meeting. As a result my own personal presentation values will not let me arrive while not looking my very best. So I carry an umbrella based on my own ‘value’ of what is important to me, regardless of the weather conditions. 4. Self or sovereignty is conduced and is value based. This leads me to abductively intuit that the fourth wave will comprise the assertion of the self or personal sovereignty. If navigated with shared value, this next stage holds the opportunity for each of us to claim our invariable and irrefutable rights. This article was written by Brian Grimmer, CEO of Present Group, with insights and understandings derived from extensive cooperation with Peter Midgley, CXO of Present Group on the Meta Model for Process.